Whether you’re an individual or a small business, blogging is the ideal way to spread your ideas, share information, and build a community around your brand. By dedicating time and resources to building a website and a blog, you create a platform where billions of Internet users can directly interact with your content. When blogs develop a dedicated audience, they transform into immensely useful tools. Websites that generate traffic have an easier time attracting new customers, establishing themselves as authorities in their respective space, and creating business opportunities that would have been otherwise inaccessible. Popular blogs can also be monetized and serve as an additional source of income. Learn more about different hosting plans at Domain.com today. Personal blogs are incredibly dynamic. They can serve as resumes, a place to compile your ideas, or a training ground to develop your communication skills. With a personal blog, you create a workspace with complete control over what people see and what you share. For small businesses, having a blog is nearly essential. If a company wants to grow, running a blog helps develop name recognition and can drastically boost visibility of your consumers. A blog can help drive sales, improve customer retention, and is an inexpensive way for a company to establish their image. It’s best to think about web hosting as a storage and management service. When you start a blog or a website, the digital information doesn’t simply exist on your computer. It’s stored by a web hosting service, like Domain.com, which keeps your information safe and secure, while ensuring that your blog or website remains operational. Without web hosting, websites, and the Internet as we know it, would not exist. Data centers are the physical location where your blog’s digital information is stored. Domain.com owns and operates a state-of-the-art data center, which was built by network certified engineers. These same engineers manage the data center and ensure that Domain.com’s servers–powerful computers that contain all of your blog’s information–remain safe from threats like humidity or fire. They also make sure the servers continue performing at the highest possible level. Why is web hosting important for your blog? When most people start a blog, they’re only thinking about content; they want to start posting and building a community as quickly as possible. In doing so, they skip the vital steps of ensuring that their blog is secure, owned by them, and will remain in their control for the long haul. 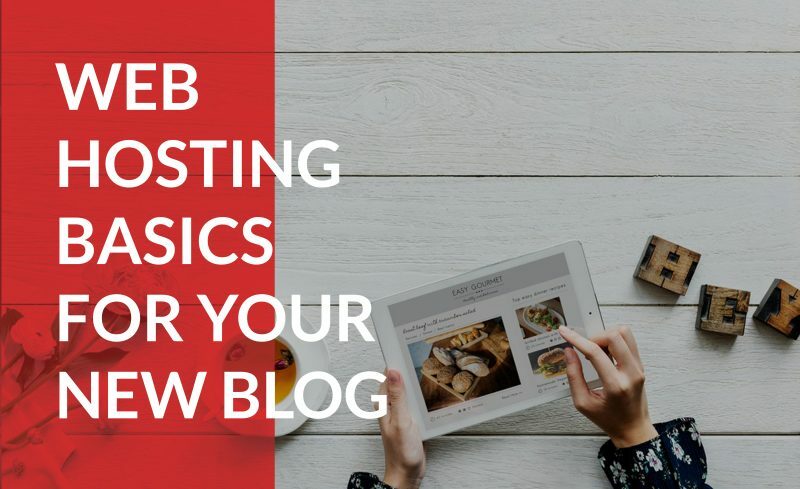 Your website host is responsible for ensuring that your blog is running at a speed that accommodates traffic and is otherwise functioning as it should. When you sign up for a hosting plan, you’re essentially buying real estate for your blog in one of the data center servers, the place where your digital information will be stored and managed. Web hosting is the only way to ensure that your blog will remain safe on the Internet. When your blog’s digital information is under the supervision of a web host, the information is encrypted, monitored, and cared for by a highly trained support team. At Domain.com, that customer support team is available 24/7, via WebMail, Live Chat, or phone. We’re incredibly proud of our affordable, world-class hosting services. We offer bloggers a range of options, all of which can be tailored to meet your website needs and expectations. Each hosting plan comes with a free SSL certificate–a safeguard which encrypts your website data, protecting it from unwelcome visitors–and only costs $3.75 per month to get started. For bloggers, Domain.com offers a variety of hosting options, each with unique benefits and capabilities. The web hosting plan you chose will largely determine the extent to which your blog is protected, the speed of your blog, and which platforms will be available to you. When you sign up for a hosting plan with Domain.com, you may notice the term “Linux.” This is an operating systems, a platform which uses a unique programming language, used to build your blog or website. Linux is the most popular web hosting operating system on the Internet. It’s less expensive than other options, and is known for pairing stability with security. Without getting too technical, it runs on programming languages like Perl, PHP, and MySQL. These are open source software languages favored by developers for the freedom they offer, and their low operational costs. For bloggers, Linux offers tools which make customization simple, and allow you to creatively engage with the design process. If you’re just starting out in the blogosphere, a shared hosting plan might be best. They require minimum technical knowledge, are highly affordable, and come with a free SSL Certificate. When you buy a shared hosting plan, your blog is stored on a server with other blogs and websites. All blogs and websites on that server share the same pool of resources. Shared hosting is like moving into a busy, safe, inexpensive neighborhood. The price is lowered because everyone in the neighborhood is contributing to the same set of resources. However, just like in a busy neighborhood, there are times when traffic picks up, and during those times everyone in the neighborhood might move a little slower until it clears. However, the difference in speed is typically negligible. When you sign up for a shared hosting plan with Domain.com, you are guaranteed unlimited website disk space, scalable bandwidth, at least 100 email addresses, free applications like WordPress (ideal for bloggers), and many other features. You also have unlimited access to our 24/7 customer support team. VPS (Virtual Private Server) hosting is a step above shared hosting plans. When you buy a VPS hosting plan, you are essentially securing a mini-server within the larger server. If a shared server is a busy, safe, inexpensive neighborhood, a Virtual Private Server is like a gated community one district over. Bloggers with a VPS plan enjoy enhanced privacy, have greater control over their virtual space, and aren’t as affected by issues of traffic. The portion of the server you pay for is wholly dedicated to you and your blog. VPS hosting is ideal for bloggers who have either outgrown or plan to outgrow, their shared server. If your blog starts attracting significant traffic (somewhere above 5,000 visitors per day) your website speed will suffer on a shared server. If your blog is affiliated with a business, running a slow website introduces the risk of dissuading customers from engaging with your content. Domain.com offers world class VPS hosting at an affordable cost. If you’re having trouble deciding between shared hosting and VPS hosting options, know that upgrading later is a possibility. If you’re only interested in blogging and don’t anticipate building out a full website, WordPress hosting is the ideal platform. It was tailor-made for bloggers (Domain.com even offers a free .blog domain name extension with a plan) and comes loaded with built-in features that allow you to easily customize your page. If you do choose a WordPress hosting plan, you will be restricted from setting up a non-WordPress site. However, the capabilities embedded within the WordPress platform are comprehensive and can satisfy the needs of all bloggers, from beginners to veterans. The package offers unlimited disk space and bandwidth, free domain registration, unlimited email accounts, free search engine marketing credits, and 24/7 support. If you aren’t satisfied with your WordPress hosting plan within 30 days, Domain.com will refund your hosting fees, no questions asked. WordPress hosted blogs enjoy a selection of popular handpicked themes, designed to make your blog visually attractive. Pre-installed plugins allow you to customize your blog with extra features and functionality. A customized control panel was designed to easily access frequently used tools and streamline the blog building process. The WP Essential plan contains all of the options and functionality of the WP Starter plan, but comes with three distinguishing features. Blogs hosted with WP Essential live on reconfigured servers, which means less neighborhood traffic and greater website speeds. They come with a built-in firewall and automatic malware removal, a deluxe security bundle designed by the experts at SiteLock. The plan also connects customers to a team of support agents capable of resolving all issues related to WP Essential. If you’ve looked over Domain.com’s web hosting options but still can’t decide which is the best for your blog, there are some questions you can ask yourself to narrow the field. How much website traffic do I expect? If you expect that your blog will generate significant traffic, VPS hosting and the WordPress Essential plan are both powerful options which can support heightened web traffic. Do I want multiple blogs or websites? Both the Deluxe and Ultra shared hosting plans permit unlimited domains to be created. Unlimited domains are also offered with the VPS hosting plan. How concerned am I about safety? While all of Domain.com’s hosting plans are safe and dependable, the VPS hosting plan and the WordPress Essential plan provide even more protection from potential web threats. Do I feel comfortable working on the backend? How comfortable are you with designing your own blog? WordPress Hosting offers handpicked themes and pre-installed plugins that make assembling a webpage both intuitive and simple. After you’ve picked a web hosting plan, the next step is to register a domain name. Since the year 2000, Domain.com has been a leading web registrar and has made it both easy and inexpensive for web users to secure domain names. Domain.com offers the lowest registration and renewal prices, as well as the highest registration discounts. The best way to think about a domain name is by comparing it to a street address. If you want to find someone’s house, you ask for a combination of letters and numbers that represent a specific location. In much the same way, a domain name is the Internet’s version of a street address. When you type in a specific name, your Internet browser runs a search for that address, locates it, and then takes you there. When people ask how to find your blog, you can simply provide your domain name that leads them to your website. Remember that when you sign up for WordPress Hosting, free domain registration is included, in addition to a free .blog domain extension. TLD stands for Top Level Domain, also referred to as a domain extension. If you’ve spent any time on the Internet, you know what they look like. The most recognizable and popular TLD in the world is .com, which is affixed to the end of most web addresses. While .com is the most common domain extension, there are hundreds of alternative options. Domain.com offers access to all major domain extensions, from the increasingly popular .me all the way to .blog and .healthcare. If you’re starting a blog for your business, it might be worth registering a TLD that fits the services you offer. Whether you’re an individual, a small business, or a major corporation, starting a blog lets you connect with your customers in a new way and build a powerful relationship. Once you decided the right hosting plan for your blog, register a domain name and start producing connect that connects customers to your business.